About the same time in 1984 when the video game industry was crashing in the west, a computer scientist named Alexey Pajitnov was busy playing with his first computer at the Soviet Academy of Sciences in Moscow... and wound up creating one of the most classic - and addictive - games ever. 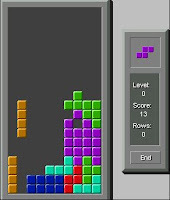 The Guardian has a great story about Tetris on the occasion of its twenty-fifth anniversary. Among the highlights: how Pajitnov came up with the concept, the tale of how this communist-era game became a capitalist's dream product, and how Tetris has inspired everything from architecture to conspiracy theories. As a Reuters article clearly points out, there is a huge amount of violence in today's video games and Tetris is the opposite.